Idiopathic Edema (IE), is a syndrome involving real or perceived weight gain secondary to the pathological retention of fluid. This syndrome of generalized edema is almost solely reported in women. The diagnosis of IE is one of exclusion and requires a careful history, physical exam, and clinical suspicion. The aim of this article is to provide a comprehensive review of the available literature in order to attempt to define IE, identify the possible causes, review the proposed pathophysiology, and discuss potential treatment options. Keywords: Capillary leak syndrome, compartment syndrome, cyclic edema, edema secondary to medications, hyponatremia, idiopathic edema, sodium concentration. Keywords:Capillary leak syndrome, compartment syndrome, cyclic edema, edema secondary to medications, hyponatremia, idiopathic edema, sodium concentration. Abstract:Idiopathic Edema (IE), is a syndrome involving real or perceived weight gain secondary to the pathological retention of fluid. This syndrome of generalized edema is almost solely reported in women. The diagnosis of IE is one of exclusion and requires a careful history, physical exam, and clinical suspicion. 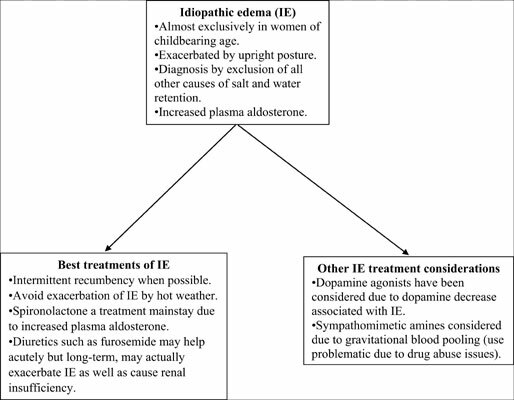 The aim of this article is to provide a comprehensive review of the available literature in order to attempt to define IE, identify the possible causes, review the proposed pathophysiology, and discuss potential treatment options.